It must be hard to draw the Batman origin scene and keep it fresh. It has been done, portrayed and even illustrated in so many ways, unless you have your own unmistakable style, you could easily blend in and create a 'Groundhog Day' piece. Luckily 'unmistakable' is Lee's middle name - not whatever his mother thinks it is. AMERICAN VAMPIRE: SECOND CYCLE #2 Pearl digs deeper into the mystery of the Gray Trader and uncovers horrifying truths. Meanwhile, Skinner must confront his demons, both figurative and literal. Mature Readers. 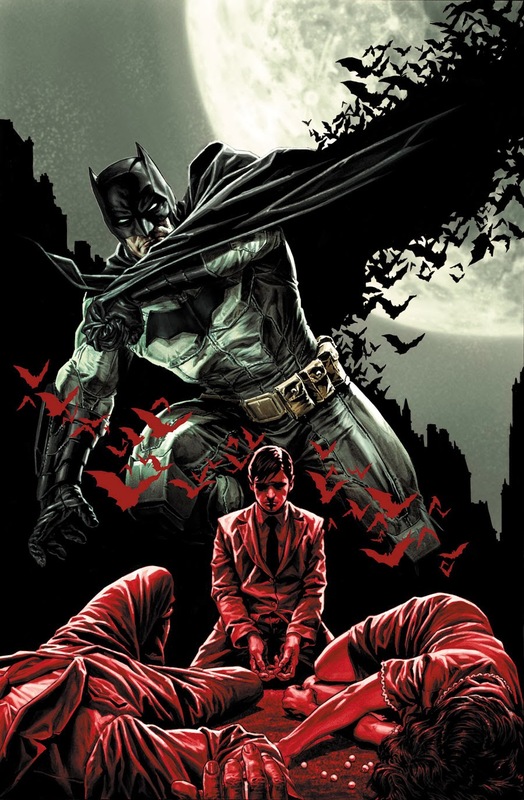 (W) Scott Snyder (A) Rafael Albuquerque. BATMAN/SUPERMAN #11 A new arc begins! As something terrible happens to the World’s Finest team, a Dark Knight who is not quite himself must team up with Lois Lane to find a missing Man of Steel. Meanwhile, Selina Kyle encounters a person of amazing strength who has no idea who he is. (W) Greg Pak (A) Jae Lee. What do you think? For the full list of DC's May 2014 solicitations, click the jump.